Chick Fil A Sauce to me, is almost as good as the Chick Fil A sandwich. Now it may be only my opinion, but I believe this recipe, while not the real recipe, tastes like the Chick Fil A sauce. Chick Fil A is famous for its chicken sandwiches. Its well-known slogan “EAT MOR CHIKIN” is very apt and makes cows happy. Serving a boneless, breaded chicken breast was a novelty for its time – it’s hard to believe, but no other fast food restaurant had a chicken sandwich on its menu. Truett Cathy, Chick Fil A’s founder, experimented for years to finally arrive at the perfect chicken sandwich in 1964. That capital “A” means “grade A top quality.” Truett’s happy customers told him, “We like it, don’t change it again,” and it never has been. Read more about Chick Fil A’s history by clicking here. A Chick Fil A chicken sandwich is even more delicious when spread with Chick Fil A Sauce. I don’t have access to Chick Fil A’s recipe, but I believe my version tastes just like their sauce and is just as good. Unfortunately, some people live in a Chick Fil A “desert,” but, if you don’t have a Chick Fil A around, you can make this famous sauce in your own kitchen and even enjoy it on a Sunday when all Chick Fil As are closed. What makes Chick Fil A Sauce so Good? The sauce began as a happy accident when an employee who wasn’t paying attention put honey mustard dipping sauce into a dispenser containing barbecue sauce. This combination created something magical and led to the famous Chick Fil A Sauce. Somehow, this sauce’s blend of honey mustard, barbecue sauce, and ranch dressing is much better than any one of those sauces alone. 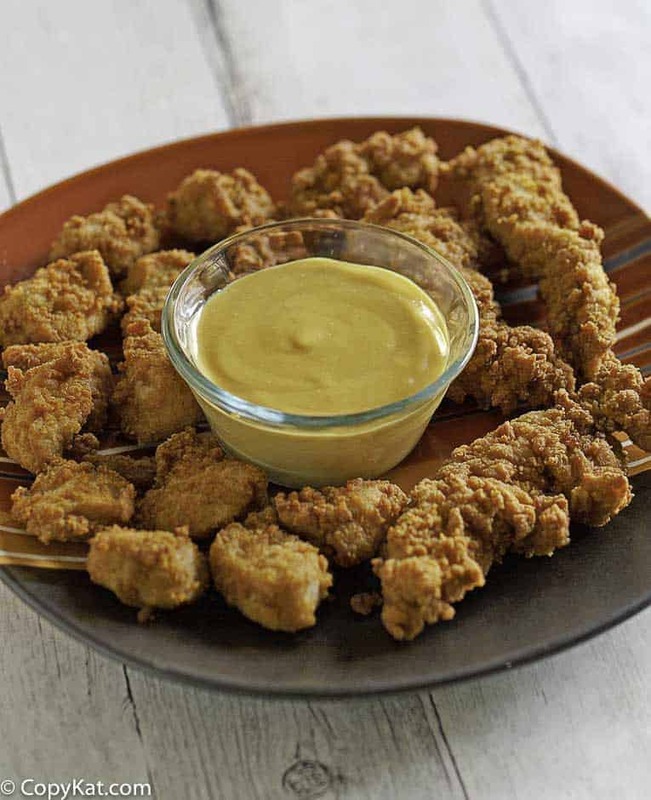 The taste is honey mustard with piquant undertones of barbecue – and the ranch adds a smooth creaminess. Is Chick Fil A Sauce Dairy Free? Chick Fil A Sauce does not contain milk, cream, or cheese. It does contain mayonnaise. Can You Buy Chick Fil A Sauce? If you’re like many people and you can’t live without Chick-fil-A Sauce, you can ask for extra when you order at Chick-fil-A. You can also buy the sauce on Amazon along with the chain’s other tasty sauces – Polynesian, Garlic & Herb Ranch, and Zesty Buffalo. Do you want to complete the meal? Check out these copycat favorites. Combine all ingredients in a small bowl. Stir to combine. This will stay fresh in the refrigerator for up to 10 days. It is really sweet when you make it. I recommend adding a little white distilled or apple cider vinegar to get the zing you get from Chick-fil-A. Great idea! Can’t wait to try your way, thanks for sharing! This might work but I made it just as the recipe called for and no one in my family thought it tasted ANYTHING like the original sauce. It’s not bad, but it’s NOT Chik-full-A! I am very sorry that you didn’t enjoy the recipe Chef Ninja. Looking for popcorn chicken recipe from Chick Fil A. Thank you for your request. I am sorry I do not have this one just yet. I am hosting a party with 42 children in attendance, is there a large batch recipe? You could easily triple the recipe, and it would work fine. What would you do with a gallon of that sauce? The kids begged for more! I love this sauce, so glad I can make it at home now! I need to try this! My kids will surely love this! Such a good sauce, especially for chicken fingers! I’ve made these before, they’re my favorite!